In 2005, severe flooding caused water damage to a church and surrounding areas in Truckee, California. The damage called for a federally funded restoration of Trout Creek, which included rehabilitating a three-mile stretch of the waterway over the next five years. A major part of the project included emergency replacement of a damaged culvert at Donner Pass Road. 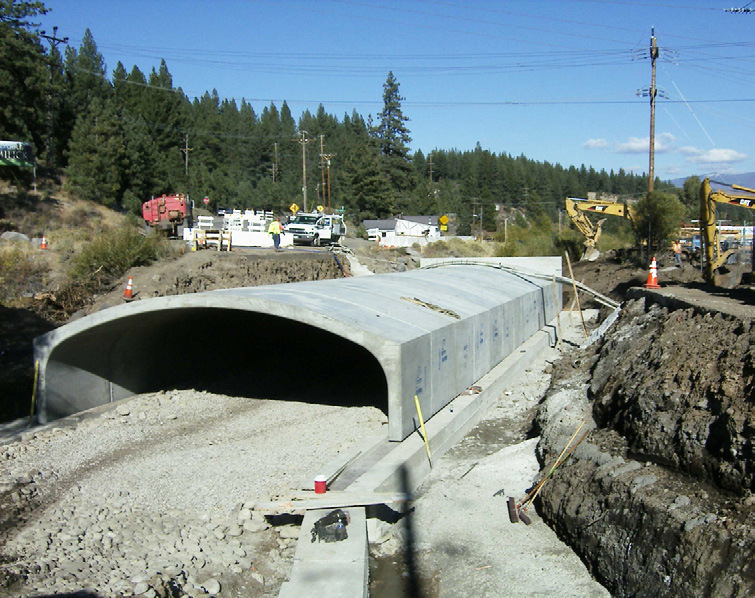 The Town of Truckee worked with general contractor, Yubacon Inc. and Contech to have the bridge completed by winter. In just six weeks, the entire project was designed, manufactured and installed to meet the extremely tight deadline. “It took an effort from everyone involved to get the bridge built before winter” said Tom Landry, Town of Truckee Senior Engineer. Use of a CON/SPAN® precast arch system led to the success of the challenging project that included working around fiber-optic utility lines. The precast units were lifted by crane and set, and then slid into place underneath the power lines. Fifteen total precast arch units, headwalls and wingwalls were installed and Donner Pass Road was reopened according to schedule on October 16. The continuing restoration project will involve a revegetation process around Trout Creek and assistance by the Department of Fish and Game to encourage fish to spawn.